Father’s Day without a party arrangement sounds incomplete. So go ahead and arrange for a grand party dedicating to your Daddy Darling. 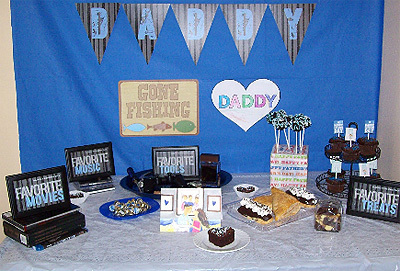 Here’s a list of party ideas, utilising which you are sure to come up with some exciting party in honor of your Dad. But make sure you follow every steps with full dedication. Our best wishes are with you and you are sure to come up with a grand party arrangement. So go ahead and hit the floor! 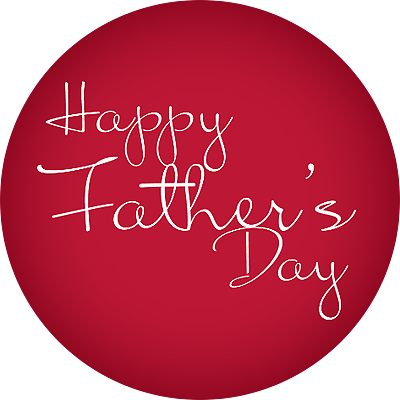 Father's Day is a day to show your father how much he means to you and how everything he does is appreciated. He guided you and gave you confidence and eventually made you into the person you are. So why not throw him an unforgettable party? After all the hard work he does, he deserves a big party. Without further ado, let’s get started. 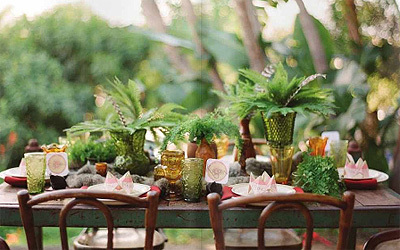 - Firstly, decide where you want to host the party, indoors or outdoors. Keep in mind, while hosting outdoors, to take the necessary precautions in case it rains. On the other hand, outdoor barbeque parties are very exciting as you can enjoy the beautiful weather and indulge yourself in various outdoor games and activities. If you’re hosting indoors, make sure you have ample space to let your guests sit and enjoy comfortably. You won’t want them to feel stuffed. - Decorate the table with a nice colorful tablecloth. Place an attractive centerpiece on the table. It could be flowers or just greens (leaves) or perhaps beer mug candles. Use rhomboid shaped plates for serving for a different touch. Place the kerchiefs in a cone shape on top of the plates. Finally, get hold of crockery with a handle for an outdoorsy feel. For hosting indoors, arrange a large buffet table with a head chair decorated as a throne for your father. These little touches will surely make him feel extra special. - Set up a mini bar counter and scatter bottle caps all around for added effect. You could also decorate some empty beer bottles and place them for decoration. 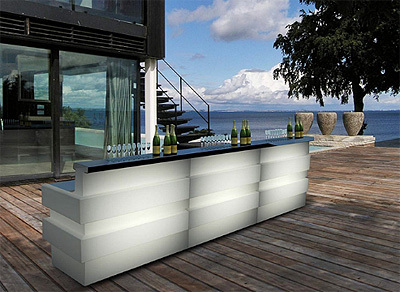 Make sure you manage the bar counter yourself and serve the best drinks to guests. It is sure to help them relax and mingle with each other. You didn’t arrange a bar counter if you’re hosting indoors. Simply serving the drinks on a tray is enough. However, you could still decorate the buffet table with beer bottle caps and empty decorated bottles. - Set up a small table. Dig up some photos of all the fathers in the family, as far as you can find. Align them together on one side of the table and write witty captions under each for a good laugh. Go all the way up to your great-great grandfather, if not further. On the other side, display some venerable Father’s Day cards and crafts which your dad has kept for years (ask your mother to help you). If you’re hosting the party indoors, make sure the table is presented at the entrance so that everyone can see how special your father is. - Set the mood for the party with the right kind of party. Be it some techno numbers to get the feet dancing or be it retro numbers from the likes of Boney M, Beatles, etc, keep the music going. If you are profound at any kind of instrument and/or singing, why not play a number or two? Nothing serves greater than a musical from an own child. Try to learn your father’s favorite numbers to earn that extra inch of a smile. 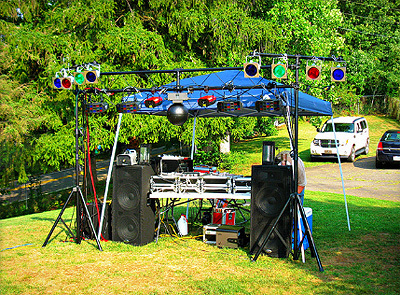 An outdoor set up is costlier than an indoor music system however it is far more enjoyable. 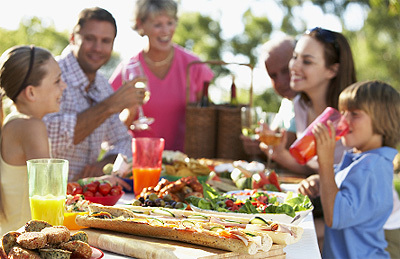 - Arrange for his favorite sport or game to be incorporated into the party, especially if it’s outdoors. If it is soccer, make a small post and let people have a turn each to try and score. If it is golf, lay out a mini-put mat and let others try a hole in one. If it’s baseball, make a short pitch and start playing. This could stir up some old memories of playing with your dad. If it’s indoors, you can’t really help but arrange indoor games. However if you’ve got an Xbox Kinect at home, it could be tons of fun, especially you’ve got a lot of guests. - Finally, get your gift(s) in order. 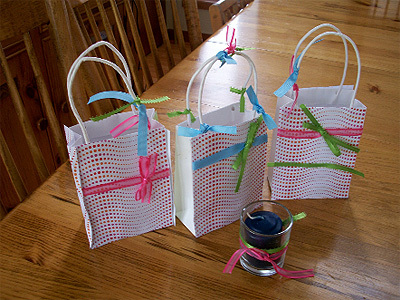 Decorate them beautifully and try your best to catch your dad off guard while presenting the gifts. Alternatively you could also gather your old father’s day gifts from your mother and wrap them anew and present them with the new ones. With each passing year, you could repeat this strategy for added effect.